On a tour of the Korina model in the Lake Club, I was walking with the man himself, Lakewood Ranch builder John Cannon, when we started talking about what got him started in the industry. So I asked Cannon, a self-proclaimed control freak, about the first home he built on his own. He thought back to 1990 when the new Misty Creek neighborhood, east of Interstate 75 in Sarasota County, was struggling due to a sluggish economy. They needed somebody to build a model that would shake things up. Cannon was moving up in the industry, having started with Ruth Richmond Homes in 1979, a few days after graduating from Michigan State with a degree in building construction. Cannon said Richmond was royalty in the industry at the time, a real mover and shaker. While he learned many important lessons in that first job, he also felt prepared since his education at Michigan State included lessons about marketing, advertising, communicating with people, business law and surveying. He felt fortunate as he originally was a business major but shifted to follow his passion instead of his desire to make some big bucks. After college, 11 years flew past and Cannon was ready to take his best shot at working for himself. He said he overpaid for the right to build that first custom model in Misty Creek, but he said it was the best deal he ever made. "I felt it was cutting edge," he said. "It was called the Corsica. It had high ceilings and an open floor plan. I sold four or five that first year. I also was a first-year dad." Ok, the story about the Corsica was great and all, but I wanted to know about the very first house he built. Even as a kid, Cannon liked to build things. He smiled. In Jackson, Mich., his passion took the shape of his first tree fort in a big oak behind his home. "It kept evolving," he said with a smile. "I always was picking up scrap lumber. A whole group of us would hang out there. I was 8 or 9." It all made sense because it would take a lifetime of passion to fret over the details that go into one of his homes. He walked around the Korina, pointing up and down at various strokes of artistry that singlehandedly might go unnoticed, but cumulatively equal the "wow" effect. The Manatee-Sarasota Building Industry Association agreed during its Parade of Homes awards. The Korina, in Lakeview Estates, won for best overall model, best curb appeal, best kitchen, best master suite, best floor plan and best architectural detail. The house is priced at $2,795,000. Cannon sells 40 to 50 of his customs homes annually and he is hands-on with every one, whether that means designing, building or getting feedback from his customers. "I've got control of the process," he said. 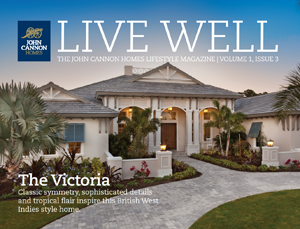 Part of that process was assembling a group of contractors who work primarily for John Cannon Homes. It gives his building process an in-house feel and spreads comfort to everyone involved. "Not one sub in 30-plus years has ever waited for a paycheck ... ever," he said proudly. "They never have had to worry about work or cash flow." He also has surrounded himself with long-time employees. "My main team has been with me for years," he said. "We have developed a style." He doesn't have to worry about a one-time contractor doing a job that clashes with the team's overall plan, because he works with the same people. "I'm a one-stop show guy," he said. "We have no jumbled ideas. All these things are in-house." "Each aspect is thought through," he said. "None of these things just happen. Things that are important to me — that total picture, a sense of well-being. A good design doesn't slap you in the head. There is a sense of symmetry, of proportion. When people walk up, and they walk in, it just feels good." He told a story about a customer who walked up to the Korina while he was working in the model. 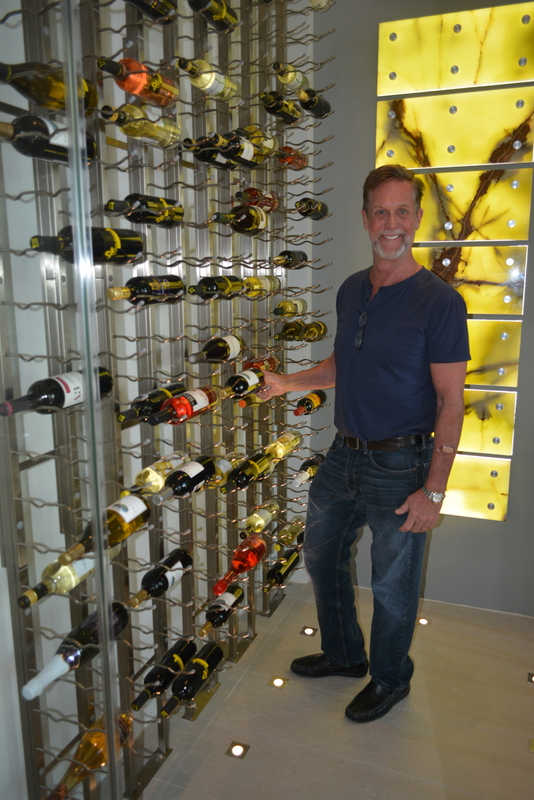 He immediately showed the visitor the custom wine room and the man replied he had never seen anything like it. "I told him, 'I am going to make a bet with you. I can impress you two to three times over when we walk through the rest of the home.'" Cannon took the man to the master closet, which rivals the size of many guest rooms. It should be noted one of Cannon's first custom home lessons was about closets, which he thought needed a few hangers and some shelves. He soon learned it was many women's priority item when seeking a home. The Korina's closets, including the "his" master closet which has a locker room feel, are opulent. The visitor beheld the closets, and told Cannon, "You've won the bet." But then he walked him to the chef's kitchen, and the man once again was floored. We walked around the home ourselves and he explained to me the many details, such as layering color as your eyes move away from a ceiling to create a flow. Or the way a model is designed with furniture so people can see traffic patterns. He pointed out some "pops" in color that remain in a customer's memory banks. He also wanted to note his most important asset in putting his business together, his wife, Phillipa. "She is the conservative one," he said. "She cleans up my messes." When Cannon's ideas get out there too far, Phillipa reels him in. The couple, who live in Siesta Key, have two grown children in Rachel, who works for the Federal Reserve Bank, and Jack, who works for a cybersecurity firm. If John Cannon ever gets a little caught up with himself, he thinks back to one of his favorite moments. He had built some models in the Edgewater neighborhood of Lakewood Ranch in the late 1990s. He had picked his kids up from school and went to check on something at the models. "When you tell your kids you are a builder, they want to see you with a hammer," he said. With Rachel in one hand and Jack in the other, he walked up to the site. They were somewhat disappointed to see he wasn't going to be doing any sawing or hammering. "I said, 'I'm the boss.'" Rachel looked at her dad and replied, "That's not what mommy says."